I recently joined the year 2007 and finally played through BioShock. I had been looking forward to playing the game because it was one of those special titles that garnered critical acclaim while also sparking critical analysis. While the argument over BioShock's ludonarrative dissonance is well worn, it did not move me in any particular way. Instead, I think the game's most important achievement is its use of tackling common video game tropes with its narrative. Although it employs some of the biggest video game cliches, BioShock dispatches them uniquely and effectively. By using its narrative to co-opt gameplay tropes, BioShock lessens their dissonant effects. While the necessity of this warning is currently being debated, I still think I should warn folks that there will be major plot spoilers in this post. Video games succeed as entertainment and art because players are willing to suspend their disbelief. If a player questioned any given game character's counter-intuitive actions, the number of logical holes to fall through would render most games unplayable. Why would the knight in Ironsword eat strange meat that he found in a treasure box? How can Faith fall fifty stories to her doom, and then be revived instantly for another go? How does what's-her-face from Heavenly Sword survive in battle wearing a piece from the slave-Leia collection? The Trope: The vita chambers serve as BioShock's continue and spawning system. Games traditionally implement some kind of system to dole out punishment while also showing the player mercy if they fail. After all, most games would not work narrotologically nor mechanically if the player had to start all the way over every time they "died." The Narrative Solution: The vita chambers are not continue screens, they are cloning cylinders. In actuality, every time the player dies, a new protagonist is being created. This sidesteps the dissonance of a "game over" screen and also explains why enemies retain their damage and ammo remains spent after the player dies. The conventional "continue" system fits with Rapture's logic. The Trope: Psychos enemies wearing strange costumes are nothing new. The Narrative Solution: The story is set in a world where most of the people are essentially drug junkies. Because of their addiction, they spiral into madness while also being manipulated byFontaine. The masks make them especially creepy while staying logical within the game's story: Fontaine released an army of Splicers during a new Year's Eve masquerade ball. If one can suspend disbelief enough to believe a city could be built underwater, drug addiction and class warfare are hardly logical leaps. The Trope: Players often force a game's main character to take preposterous actions. However, neither the player nor NPCs blink when the protagonist ingests medicine found on the floor, becomes proficient with military grade weapons, and unquestioningly follows the advice of random townspeople. The Narrative Solution: Jack's genetic modification and behavioral conditioning not only explain his malleability, but also awaken the player to their own complaisant attitude. Although I saw Atlus ' betrayal coming a mile away, I found the back-story behind his ability to control Jack highly believable in the context of the story. More importantly, it demonstrated to me how much faith I put in the information NPCs provide me, as well as the ludicrous behavior I act out while controlling a virtual character. My first thought when I saw Jack inject his initial vial of Eve was "Hmmm...that can't be sanitary....Well, whatever; it's a video game." I had been conditioned accept the absurdity in a game and was prepared to simply accept that Jack's motivations and my actions were dissonant with reality. BioShock's story demonstrates that dissonance can be overcome even when employing gameplay and story elements that have been historically beholden to the suspension of disbelief. 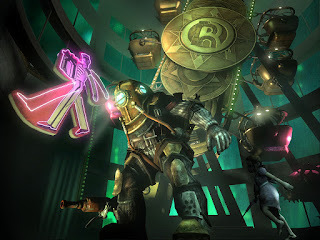 While it is laudable to engineer new ways of playing games to prevent the reliance on stale tropes, BioShock stands as an example of how a story can revitalize and utilize common game conventions. By taking care to construct a narrative with consistent logic, BioShock creatively wields ancient cliches as tools in the creation of an immersive experience. I guess it's no surprise that I am making a comment on a post about BioShock, eh? Anyway, one of the things I love about the way BioShock handled things is exactly what you outline in the post and how it then goes beyond that. For example, you refer to the Splicers as being drug-junkies. You are right, but it goes beyond that when you factor in that Andrew Ryan created Rapture as a place basically for the Elite; a place for people who are above the norm and 'worth having' in a place like Rapture. Their drug use, basically, could also subtly communicate to the player that the Splicers -- who used to be the 'normal' residents of Rapture -- use and desire more of it because of the pressures that they had to live up to and even the image/s that they were supposed to represent. The stresses of this got the better of them and their addiction increased the more they went on until naturally, they became the crazed citizens of Rapture that Jack sees throughout his time in the city. I probably didn't describe what I meant very well (it's almost 5:30am) but basically what I'm trying to say is that one of the things that I love about the game is how the narrative works to give reason to why something exists in the game, but also extends upon it in a subtle way for the sorts of players who enjoy immersing themselves completely in the overall experience. Great post Scott and while I'm here, kudos to the both of you for the posts for the Roundtable (something I wouldn't mind joining in on) and also the genre posts from Jorge and yours on Okami, Scott. Been a while since I have commented, so I apologise for that. We like to thank we can be your home away from from, always there to come back to. I also agree wholeheartedly with your comment. Oddly enough, and maybe I'm the only one, but I felt bad for the splicers after awhile. There are numerous recordings of people you feel sympathy for, people's who's world came tumbling down around them. @Jorge - Yep absolutely, I started to hesitate with killing them once I realised that they were just normal (if Rapture citizens could be called that) citizens who turned crazy. BioShock really nailed the subtlety where it needed to, actually. But that's all I will say otherwise I will come across as a rampant fanboy. I wonder if they'll be able to re-capture these feelings in the sequel? It's hard enough to make gameplay as novel and fun the second time around; to live up to the original's story is a tall order. I'd be lying if I said I wasn't worried. @Scott - I share your concerns. I can't help but fear how the sequel (and any other game in the series for that matter) will turn out so hopefully our concerns don't evolve into disappointment when we are playing the game. That said, I think that if Levine plays a part in the game's creation (and I think it has been confirmed that he is) and that 2K Marin can keep the focus on Rapture rather than on something else, then the end product should turn out to be pretty good. Rapture was the main character of the game as far as I am concerned, so continuing to focus on it should see another great game. I think my biggest problem was that the physics engine does not seem to include the concept of friction, but the weapon hilarious / Mechanical design and the limitations imposed on dinosaurs engines themselves were pretty crazy too.